A dark brown bodied species. The wings are clear with a pattern of dark veins. 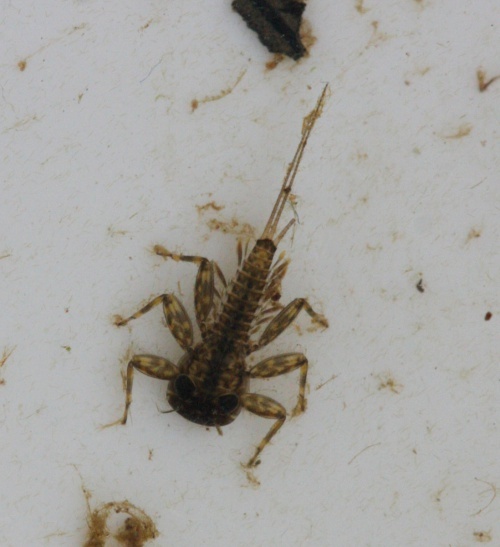 Ecdyonurus dispar is typically found in riffle areas of rivers and larger streams.ÿ It can also occasionally be found on the wave-lashed shores of larger standing waters. As its name suggests, it is an autumn and late summer species. The nymphs are usually found clinging to submerged plants and stones, although they may swim if disturbed.ÿ E. dispar feeds either by scraping periphyton from the substrate or by gathering fine particulate organic detritus from the sediment. Once mated, the female rests on a stone above the water and lays around 2500 eggs directly on the river bed by dipping the tip of her abdomen under the surface. Thought to be widespread in suitable habitats throughout Britain.